Stranger Worlds: AHOY THERE! URL IS CHANGING! ^^you see what my title says. My basic problem is that my url is frankly stupid. "wishingiwasnorthern"?? I don't wish I was northern! I'm from the Midlands, and proud! I made it in what was obviously a fit of delusion, and have long wished to change it - and now that day has arrived. 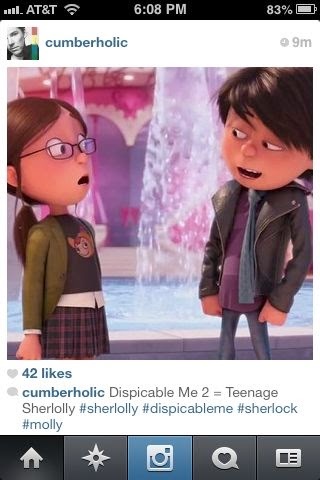 This is indeed a fandom reference, so please nod sagely (in the comments) if you get it! I'll give you one clue, which is that contrary to the rest of my life, it's not Harry Potter related. If you've read the book please tell me (silent followers, that means you!). I'm going to set up a url redirecting thingy, which hopefully will have redirected you here in the first place. If necessary you may need to refollow me, though I'm not sure. We'll work it out. 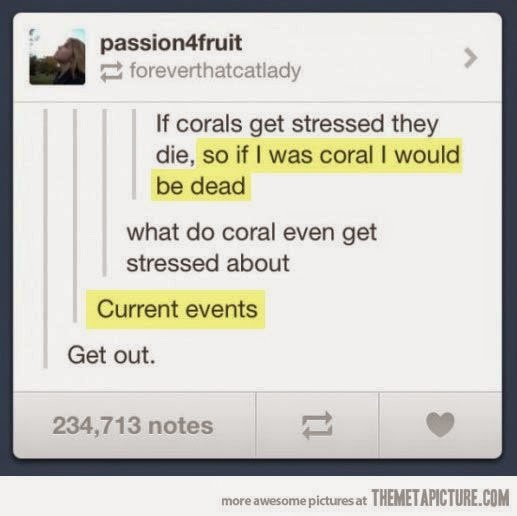 Not quite knowing how to end this post, have some amusing pictures (they amused me, anyway). ssshhh I'm seeing if anyone else can work it out but ~lowers voice~ you're right! Thanks! It is very annoying, especially when you're afraid of losing your followers/traffic etc. etc. A url is a pretty big commitment, to be honest. I'm just glad I've changed it. THOSE PICTURES THOUGH. The first one made me snort. 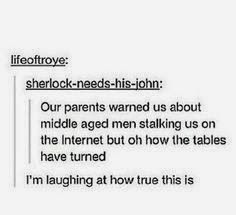 XD I stalk sooo many middle-aged men on the Internet, it's not even funny. David Tennant, Benedict Cumberbatch, Jared Padalecki, Jensen Ackles (zomg he's so cute, and I don't usually get into that stuff with celebrities), and Misha Collins, to name a few. Oooh I get it they're the Supernatural lot. I dunno Jensen Ackles is pretty beaut but I think I'd love them all more if I watched the show you know? I DON'T KNOW THE REFERENCE AND I'M DYING OF CURIOSITY. Spill? For us poor ignorant eels? Also those pictures crack me up. XD Um, yes to stalking older men.... >.> Although the older I get the more it's okay, right?! Skulduggery! I know (not from stalking your blog but, uh, perusing) that you are coming on to Mortal Coil and I think it comes up in that, if not that one then Dark Days, I'm pretty sure. They crack me up also. I dunno, I kinda feel that it gets *less* OK ... but we'll still be fangirls when we're 45! *fangirl squeeing* You should know that I stumbled across your blog through The Magic Violinist's and I clicked on the link because of your URL. *high-fives* THE SPARROW FLIES SOUTH FOR THE WINTER! I like your new URL! You changed from North to South haha. Is that a coincidence? Also, sadly I didn't understand the fandom reference to your new URL.... :( I guess I'm just out of the loop. Also, great pictures. They made me laugh a lot because they're all so true! Thanks! Yes that is it a coincidence, Seana pointed it too and that was the first I noticed. Hopefully it has some deep psychological significance that I'll soon discover ;) It's a Skulduggery Pleasant reference (you should read them). They make me laugh also!